Markos Vidalis is a professional angler – field tester. 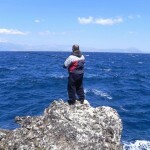 He is currently working as a chief editor and article writer in two fishing magazines in Greece (Ψάρεμα & Ψάρεμα με σκάφος) that are focused one for shore fishing and one for boat fishing. He holds chief editor’s positions for more than 6 years and is an active fishing article writer from 1997. He is currently a field tester and prostaff for DUO lures JP and ZENAQ rods JP. He is a very experienced angler in most types of modern fishing both from shore and boat but has a strong love for lure fishing of all types. He is considered to be the “ambassador” of shore jigging in Europe since he is the first European that tried this technique constantly and almost before a decade, uploaded several catches with the use of the technique in Youtube.